Recently I read a study prepared by DDI (Development Dimensions International), a well established training company. In my training days I was certified in several DDI programs – good stuff. In the comprehensive study, leaders from a variety of organizations reported on the state of leadership development within their organizations. They identified gaps in leadership development and the important skills needed for today and moving into the future. The data is sobering and certainly I will come back to comment more in future posts. For now though, one result caught my eye. The number one skill for leaders going forward is, “fostering creativity and innovation”. It is a leadership skill in short supply in many organizations. It is one thing to recognize the need to change. It is another to create a path to get there. The pull of our past is powerful. Many of us grew up in organizations dominated by a manufacturing business management approach. Yet service businesses now drive economies. It is there that creativity and innovation at all levels of an organization are real difference makers. Yet we think still of widgets and predictable production lines. We measure, establish trends, and focus on the narrow band of average within our service companies. We herd our people into the trend-line. Success comes from the predictable. Our services are manufactured still. Consider the graph below. A fairly basic trend chart with one outlier – a measurement error for sure. This comes from Shawn Achor’s book, The Happiness Advantage where he makes the case to focus away from the average and all eyes on any outliers. It is also a concept in Malcolm Gladwell’s book, Outliers. There is something different there. Through them we may indeed find our means to foster creativity and innovation. Such a challenge for organizational leaders to move away from “the cult of the average”, that safe and predictable trend line. For many it is not possible. It requires a real shift in attitude and I believe only leaders keenly focused on serving their employees and whom themselves have a creative approach to work and seek out innovation. Traits that are not generally rewarded in too many organizations. So what happens to our red dots? We ignore them at best or at worse, we force them back into the average. More often than not they are good to great employees, if not a bit odd, even considered weird, always compared to the average. The cult of the average does not suit them and they leave. Before they leave though, Human Resources will conduct exit interviews and document why the red dots are leaving. Senior leaders will read these reports and usually dismiss them. All the while, knowing that they need more creativity and innovation in their organization. The answer is right there. Creativity and innovation, a skill set for leaders as well as the people they lead. So true. And I think people are increasingly scared of being seen as a red dot. so they restrict themselves to keep in with the norm group. Leaders are making it less ok to take risk, and so innovation is stifled. 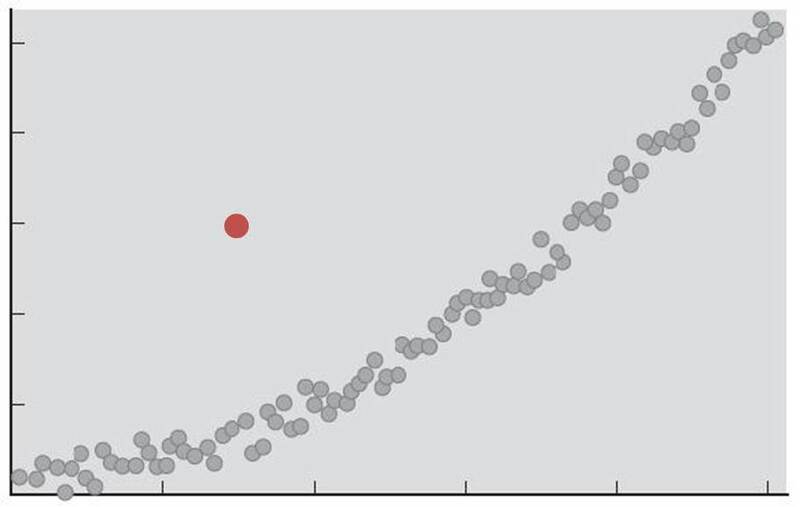 I wonder as the recession appears to left whether more red dots will appear on the slide? Let’s hope so. Is it possible to find out more about the research DDI did? Hi Michael! I’m in total agreement that many people are scared of being seen as red dots even though it takes a different approach to innovate and achieve greatness. I commented earlier today on this topic. I was able to find the link to the DDI study. Here it is. You may need to register to get the full study. Lots of great information here. Thanks so much Michael, I will dig it out. Michael and James – thanks for the visit and comments. I agree with your thoughts. Let me look for the link to the full study when I get back to work on Monday. Here is a link to an abbreviated article on the same subject from DDI. It has been a month or so since I read the full study – I will try to track it down. Thanks Rich – yes indeed the training is so average. Yes, I have read Barb’s book. As you say it is sobering and very thought-provoking. I left training and development years ago because of these issues. I wanted to develop my leadership on the front lines instead from the HR tower. Due to career changes (company in runoff) I am planning a move back to HR/OD over the next year and yes, leadership development. Those of us who care about this topic can still make a difference for people. A better approach awaits.